For decades, Wrangel Island has been classified as a nature preserve. 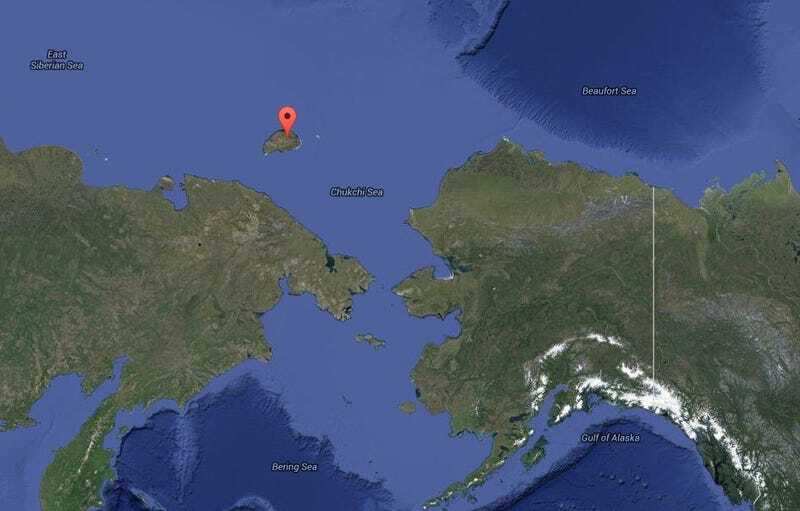 Situated in the icy Chukchi Sea which flows between the Russian and Alaskan coasts, this quiet, hilly island is now home to a rapidly-growing Russian military base comprised of "prefabricated modules" arranged in a star formation. It sounds a lot like the kinds of star forts that were a popular form of defense during the age of gunpowder warfare in the seventeenth and eighteenth centuries. The Moscow Times is reporting that this is part of President Putin's plan to remilitarize the Arctic, bringing its defenses in the region back up to Cold War levels. But unlike bases planted in this remote area during the Cold War, the Wrangel Island installation won't just be for guarding the border. It could become a major part of new trade routes that will be established in the area as the ice cap melts away. Plus, it will be used to coordinate mining operations. Essentially, this base and a matching one on shore at Cape Schmidt (see red marker on map below) will secure Russia's economic interests in the region. It sounds like the plot of a Tobias Buckell novel. What could go wrong?